Turn Off Google Personalization for Unbiased Search Results - Is it Cool or a Curse? Google personalization, that is applied as a default, is a cool tool or a curse. It depends on your point of view, and what you are searching for and why. It has many benefits in delivering more relevant and local search results if this is what you want. It has an insidious side, by shoving ads in your face, which Google thinks will be more 'appealing' to you. It can be seen as a filter or censoring tool. The results are likely to provide users with more customised results that are better targeted for the user by eliminating irrelevant results from the general area, but this may hamper the notion of the Internet as 'FREE' and OPEN' and serendipitous discovery which fosters creativity. What are the implications and how can you turn personalisation off? More and more Internet sites and search engines are tailoring their services to the idiosyncrasies of individual users, queries for 'stem cells', 'climate change', and even 'pizza' may yield different outcomes for different people. Most people searching for 'pizza' would want local results, except if they were after recipes and more general information. The problem is that the search will be local and personalized by default - you're excluded from the more general search results. Google is telling us what we want and dishing it up in a box which contains filtered results. We are not allowed to 'think outside of the box'! Google examines your previous searches, and the various clicks you've made, using information stored in a cookie with 180 days of data. It refines its search results using this information. The SERP will constantly change or evolve with your search activity. If you search for the names of movie stars and you click on gossip blogs like Netflix, rather than another one such as Gawker, links to Netflix will feature more prominently at the top of the search results. The filtering practices are regarded by many as an invasion of privacy which destroys the soul of the internet as a free and open system. Google has been criticised for the outcome of the recent Panda update which was claimed to deliver more relevant results. But the update was based on developing hit list of sites that were downgraded. 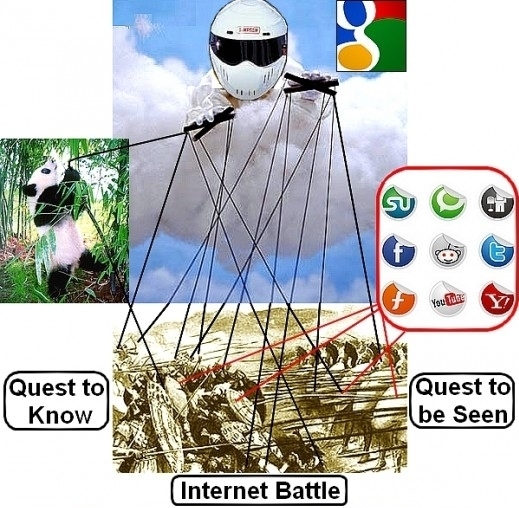 Panda elevated the 'brand name' sites ahead of the smaller sites. It also used a broad brush that tarred ALL pages and articles in a website on its hit list, irrespective of their relative quality - all were downgraded if the site was deemed to be of lower quality. This amounts to a type of censorship and would appear to be contrary to its own search principles to deliver high quality results without bias. Many have claimed that this change was driven by commercial objectives. The 'branded sites' pay more for the clicks on the adsense ads. Google claimed that the results were more relevant and had obtained feed-back from users to justify these claims. The Quest to be Seen - servicing the needs of its advertisers to be seen on the results page and to be highly relevant to the information on the page. Advertisers are continually trying to get information about the users so that their ad campaigns can be highly targeted and focused. This is exactly what Google personalisation does - it provides more relevant search results - but it also delivers more focused ads. The individual's search history is used to deliver 'personalised' ads based on what you clicked recently. The Google ads are highly personalised - the ones that appear on your screen will be different to what someone else sees for the same search query. The ads are constantly changing - like the times ('The Ads they are a changin' - sorry Bob). Personalization only works because Google and other sites (Amazon etc.) collect huge quantities of personal information about their users, creating the potential for misuse via surveillance and creating privacy issues. How secure is it? What else is it use for? In authoritarian states, it may lead to deliberate censorship: the algorithms that control what ads you see might also control what news or articles you can read. How much is this already happening for general information and news - not as censorship in democracies, but as bias nevertheless. It hampers serendipitous discovery by cloaking us in a cocoon called 'me'. It is clearly a form of filtering and bias and may hamper the delights of discovery in world not previously visited. It block creativity by hampering discovery. Scholars have been debating these issue for some time as well as the political ramifications of search engine bias. It impinges on cyberlaw, information science and economics. If you are researcher or a website developer or seo expert, personalisation can be a very annoying impediment and you should definitely look at ways to turn it off. What are the other pros and cons of Personalisation? By knowing which Web sites you like to visit and bookmark, a search engine might deliver much more relevant results which otherwise get lost on Page 100 of unpersonalized search results. Rather than harming serendipity in research results, personalization may actually help this by being more targeted and expanding on what you searched for previously. Personalization may also protect the internet by acting as a defacto controlling mechanism to confound attempts by seo experts to modify the SERP results. 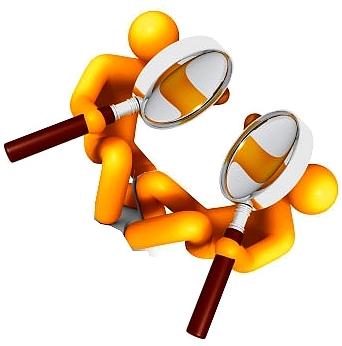 When the results for a set of keywords is fixed the seo activities can be more targeted. If the results are personalised the seo job is much harder and may be less successful. Do we really want Google, Amazon and Facebook (or rather their algorithms) to control which pages they “think” we should visit? What are their biases and tools - the algorithms and their biases are not open source - they are applied as a default not an option. Algorithms do not “think” - they compute, but they are crafted by human beings and they can be tweaked in various ways (Google Panda Update controversy). How much is the personalisation driven by the ads and the pull to sell things rather than the ultraistic concept of delivering better search results. The Google Panda update has created lots of controversy about whether Google has the right to apply its filters to deliver what it thinks we want and are more relevant. 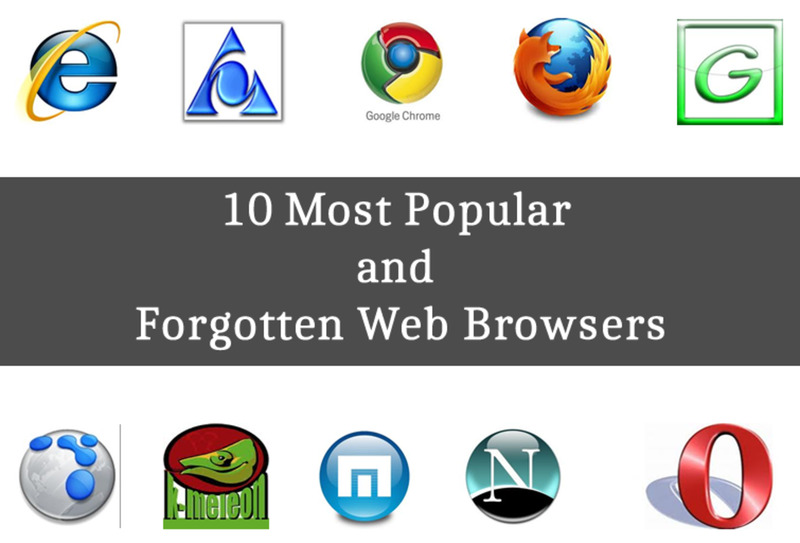 For some strange reason toolbar searches are often different to standard searches. Autocomplete and Google Instant are both personalised by default. Go to the bottom of the page and click the 'View Customization' link shown. AND then click on the 'without improvements' link on the page that pops up. For a universal way of turning it off you can use PageWash, an interface website that removes scripts and so removes personalization..
Or you can use the many browsers that do not filter the results. You can turn off Google's personalized web search results for an individual search by adding &pws=0 to the URL of a search query. http://www.google.com/search?q=seo&pws=0 shows the general unpersonalized SERP. 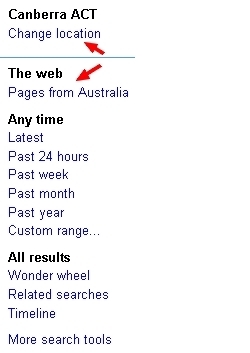 By default searches are done using the county of origin version of Google. It seems to come and go and often disappears, and I am not sure how reliable it is. It is worth a try as it appears to be the simplest method. Sometimes the results on the page don't change; and sometimes the options disappear and you will have to start again from the home page. It applies whether you are signed in or not. There have been a trail of complaints about it. 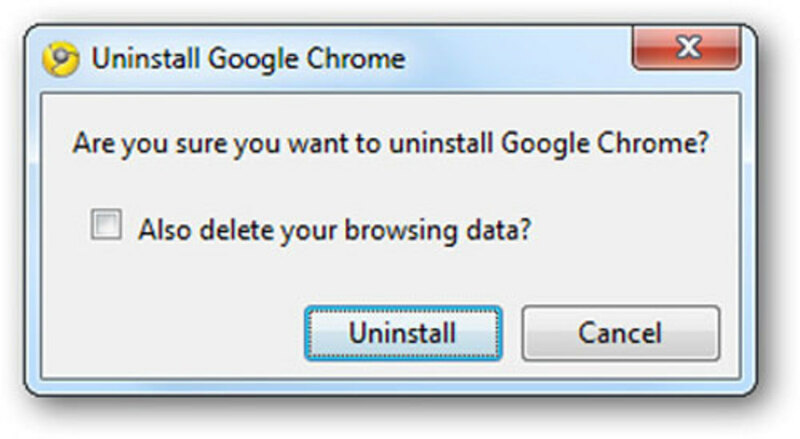 Another option is to enter www.google.com/ncr in your browser. This will take you to Main Google.com Site. [ ncr stands for No Country Redirect]. 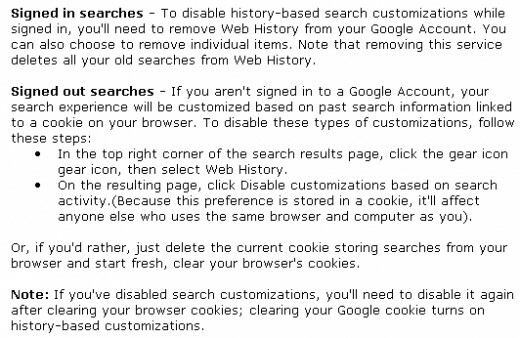 Google will set a cookie in your browser and make all your future searches default to www.google.com . To restore the 'country of origin' search you will need to clear the caches and cookies. It takes some effort but you can turn OFF Google personalisation. Its a shame that it is not an option rather than a DEFAULT. Google has no right to tell us what it thinks we want NOR to tell us what we want by default. Its motives are questionable because it cannot divorce its aim to deliver 'relevant' search results from its aim to maximum its revenue by delivering 'relevant' ads. Video SEO: Jump to the Top of Google Results! 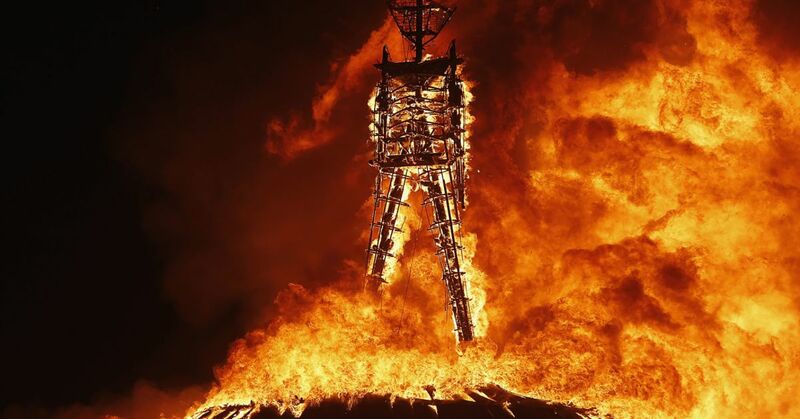 Who Is the God of the Google Gods? Very interesting information. I didn't realize all this was going on behind the scene of a google search. Do you know of a search engine that do not personalize? Google is destroying the meaning of WWW .